On this page we show you how a helicopter is built and how it flies. These are important prerequisites before your first trial flight hour. The information is divided into different areas. In addition, we recommend the video for an introduction to the helicopter flying. The rotor blades of the first helicopters were connected rigidly to the rotor shaft. This led to an uncontrollable roll movement during forward flight, because due to the higher airspeed the advancing rotor blade generated more lift than the retreating blade. This repeatedly led to problems to the point of crashes. The first one to introduce flapping hinges and rotatable joints was Juan de la Cierva with his autogyros. The hinged rotor systems possess mechanical flapping hinges and rotatable joints, as well as a bearing for the adjustment of the angle of incidence of the rotor blade (Fig 1). These hinges are very heavy on maintenance and thus expensive in upkeep. In the hingeless rotor system the mechanical flapping hinges and rotatable joints are replaced by appropriately flexible materials at the root of the blade that allow the flapping and rotation movements (Fig 2). This became possible with the invention of plastic. The BO-105 was the first helicopter with such a rotor system. The bearingless rotor has no mechanical flapping hinges and rotatable joints and the bearing for the adjustment of the angle of incidence is replaces as well with an elastomer bearing. Because no conventional mechanical bearings are used, maintenance can be reduced considerably. Large forces act on the root of the rotor blade and therefore the bearingless rotor with elastomer bearing is only suited for smaller helicopters. This system was introduced by Aerospatial with the Spheriflex rotor. Also the semi-rigid system can be classified under the hinged rotor systems (Fig 3). This is only used for helicopters with two rotor blades. The blades are connected to the rotor mast via a kind of rocker that allows flapping motions. Rotatable joints are not required for this system. A helicopter has three flight control inputs. The cyclic stick, or just cyclic, is used during hovering to direct the helicopter to the left, right, front or back. During forward flight the cyclic is used to initiate turns or up and down pitches. With the pedals the helicopter can be turned along the yaw axis while hovering and with the collective the pilot controls ascent and descent during hovering and, together with the cyclic, the speed during forward flight (Fig 1). In every helicopter the cyclic is operated with the right hand and the collective with the left. The feet are used to operate the tail rotor with the pedals. Because of a helicopter’s instability the cyclic must never be released during flight unless the helicopter is equipped with an automatic stabilization system. With the flight control elements (cyclic, collective and pedals), the angle of incidence at the main rotor resp. tail rotor is adjusted mechanically. The angle of incidence is the angle between a defined axis along the helicopter and the position of the rotor blade profile. The angle of attack on the other hand is the angle between the rotor blade profile and the oncoming airflow. This means that by adjusting the angle of incidence with the flight control elements the angle of attack, and thus the lift, changes as well. When the pilot pulls the collective upwards, the angle of incidence (and thereby the angles of attack) of all rotor blades is increased by the same amount. Thus the total lift increases und the helicopter begins to ascend. Correspondingly the angle of incidence is decreased when the pilot pushes the collective downwards (Fig 2). When the cyclic is pushed forwards, the angle of incidence of the rotor blades changes continually during one rotation. Because of the varying lift the rotor blade plane is tilted to the front. Naturally the plane is tilted to the back when the pilot pulls the cyclic backwards (Fig 3). Corresponding events happen when the pilot pushes the cyclic either to the right or the left (Fig 4). With the pedals the angle of incidence of all tail rotor blades is adjusted collectively (similar to how the collective adjusts the blades of the main rotor). Thereby the thrust of the tail rotor is de- or increased (Fig 5). However, there is always an angle. When the pilot operates one of the flight control elements he always needs to adjust the other two. As we have seen, the pilot has to pull the collective upwards when he wants to ascend during hovering. This causes the torque to increase, due to the wider angle of attack of the rotor blades (and thus greater air resistance). Thereby the helicopter begins to rotate along the yaw axis, which needs to be adjusted for via the tail rotor. Because the tail rotor now produces a greater sideway thrust, the lateral dislocation of the helicopter is increased, which needs to be adjusted for via the cyclic. You could think that the helicopter is now stably hovering. But unfortunately that’s not the case. Due to environmental influences (wind in particular) and the non-constant turbulences around the helicopter, the pilot always needs to adjust with the flight control inputs to keep the helicopter in a stable hovering flight. The big challenge is to properly coordinate all of those small adjustments. Not until a pilot in training doesn’t need to think any more about which control element to use is he able to keep the helicopter constantly in an appropriately stable hovering flight. Some time (along with a few droplets of sweat) is required to train this automatism. The steering of a helicopter requires control rods, bellcranks and control cables from the flight control elements to the swashplate (resp. to the tail rotor) (Fig. 6). The most important element in flight control is the swashplate. It is located along the rotor axis, right beneath the main rotor and is responsible for the translation of flight control inputs into motion of the main rotor blades. It consists of two parts, a stationary swashplate and a rotating swashplate. The stationary or outer part is connected to the cyclic through control rods and bellcranks. The rotating or inner part is connected to each individual rotor blade. When the swashplate is tilted forwards or sideways with the cyclic the angle of incidence of each rotor blade changes during one rotation (cyclic blade control). When the pilot pulls the collective upwards the entire swashplate moves up and the angle of incidence of all rotor blades increases at the same time (collective blade control). This principle works independently of the number of rotor blades (Fig. 7). 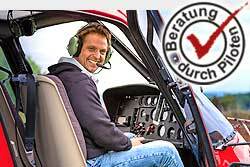 In smaller helicopters the steering is usually supported by hydraulic servomotors to reduce the effort of the pilot. In medium-sized and large helicopters the forces acting on the swashplate are so huge that a purely mechanical steering (only with control rods and bellcranks) is no longer possible without hydraulic support. The steering of the tail rotor works in basically the same way. The significant difference is that it only requires the collective blade control. The pedals in the cockpit are connected to the so called spider via control rods, bellcranks and control cables. The spider transmits the steering impulses to the tail rotor blades, similar to the swashplate and the main rotor. Also here applies that larger forces act on the tail rotors of larger helicopters and therefore the need for hydraulic support is greater (Fig 8). The NOTAR (NO TAil Rotor) is a type of helicopter with a main rotor but without a tail rotor. This technology was developed and patented by McDonnell Douglas (MD-Helicopters). The main advantage of this system is that there is no hazard from a spinning tail rotor. Also the noise level of the helicopter is greatly reduced. The tail rotors of conventional helicopters produce a majority of the noise. The concept behind the NOTARs is actually quite simple. A part of the main rotor downwash is conducted through the tail boom and subsequently conducted with a fan. The air current now runs through the tail boom and escapes in the end through pivoting jets. These jets are controlled with the pedals and allow adjustment of the torque and rotation of the helicopter around the yaw axis (Fig 9). This effect is supported mainly by the special shape and by additional escape jets along the tail boom. Due to the air current escaping only on one side the downwash is redirected to the side and accelerated. Thus a lateral aerodynamic lift is created (Fig 10). With this little trick a round body can acquire the properties of a normal wing profile. This system is used mainly for steering during hovering and slow forward flight. During fast forward flight the helicopter is steered in the yaw axis with vertically arranged side rudders. Yaw axis steering is also functional during autorotation because the fan that creates the required airflow rate is coupled mechanically to the main gear.